Oshitashi! 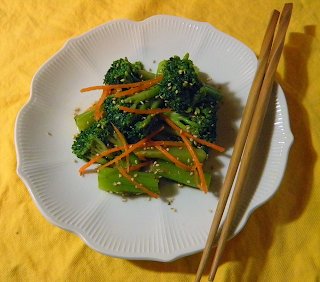 The idea came to me after scouring cookbooks for new and different broccoli recipes. The fussy broccoli-lemon-tomato casserole with great taste but odd texture, the compelling broccoli with spaghetti in yogurt and parmesan sauce that my husband vetoed, the too-dairy-rich cream of broccoli soup; these were contenders. But a simple and fresh Japanese-inspired salad won the contest. Traditional oshitashi is spinach marinated in soy sauce and mirin, a sweet low-alcohol rice wine, and sprinkled with sesame seeds. Alternatively, the sesame seeds are crushed into a paste and used with the liquids in the marinade. I’ve never actually eaten it. However, my favorite local sushi place has broccoli oshitashi on the menu. The only time we ordered it I found it disappointingly bland and oily. I thought that Bruce, the humble stir-fry king, could make up a better sauce. Bruce’s initial thought was to add a bit of sesame oil to the soy sauce and mirin. To add complexity to the overall sweet and salty flavor, I suggested some rice vinegar. We added a bit of carrot for colorful garnish. One secret to this recipe’s success is cutting the broccoli into same-size pieces so it cooks evenly. Another is to avoid overcooking the broccoli. The florets can be larger than the pieces of stems, since they are less solid and cook more quickly. The consistent size not only cooks best, but looks best. Beautiful presentation and care in preparation details—as for the carrots and sesame seeds in this recipe—are key in Japanese cookery. Oshitashi is traditionally served at room temperature. A traditional accompaniment to fish, it’s perfect with sushi. It’s also delicious compliment to grilled fish. Toast sesame seeds in frying pan over medium low heat until they get slightly darker, stirring constantly, about 5 minutes. Set aside to cool. Make carrot garnish by “zesting” carrots with a lemon zester. If you don’t have a zester, cut into 1½-inch matchsticks, as thin as possible. Don’t use the whole carrot, make an amount of garnish that will compliment rather than dominate the look of the broccoli. Use your creative judgment…but for those who like numbers, you don’t need more than about 2 tbsp. 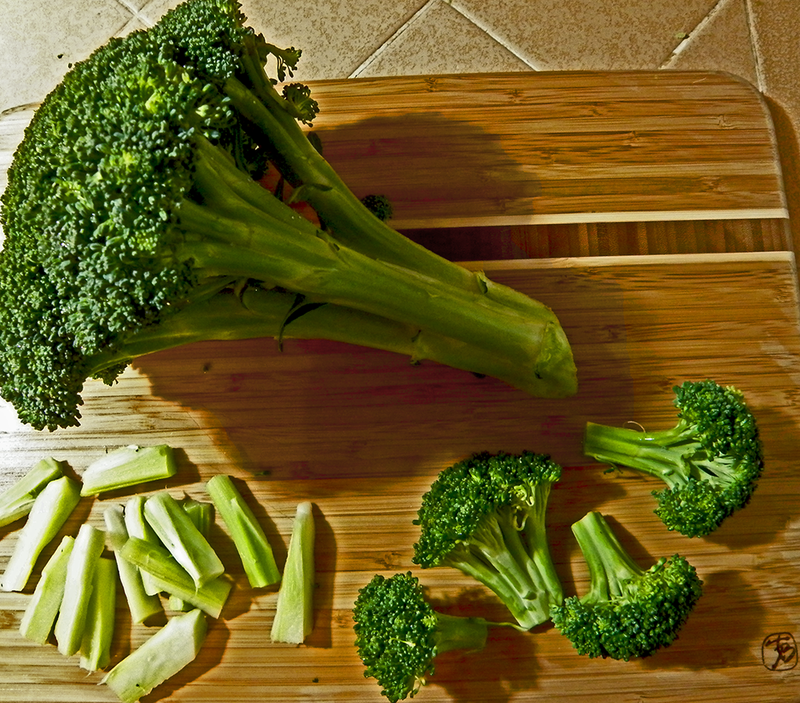 Cut up broccoli into consistent-size pieces, about 1½ inches long. Cut florets from top about 1½ or 2 inches long. Slice larger florets in half or thirds, to make floret size as consistent as possible. Carefully peel the stems and slice into approximately 1 ½ inch lengths of about 3/8 inch thickness. 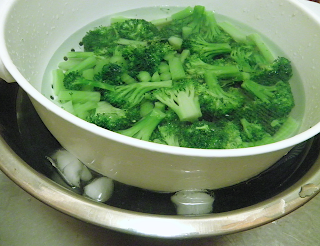 Boil broccoli in salted water about 3 minutes, till tender but still crunchy. Plunge into cold water to stop cooking—put ice cubes in the water for fastest cooling. 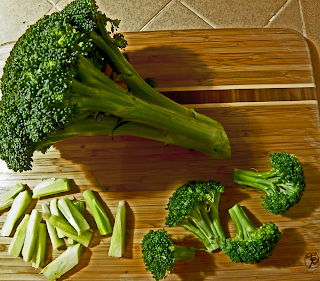 Drain broccoli thoroughly and pat dry. While broccoli is cooking, make dressing by combining soy sauce, mirin, rice vinegar, and sesame oil. Pour dressing over drained, cooled, and dried broccoli. Stir to coat all sides of all pieces. Put onto individual plates and garnish with zested carrot. 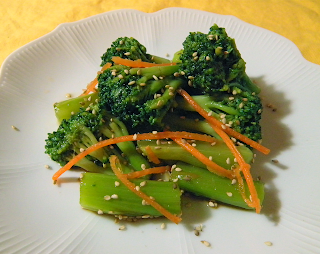 Sprinkle with toasted sesame seeds.